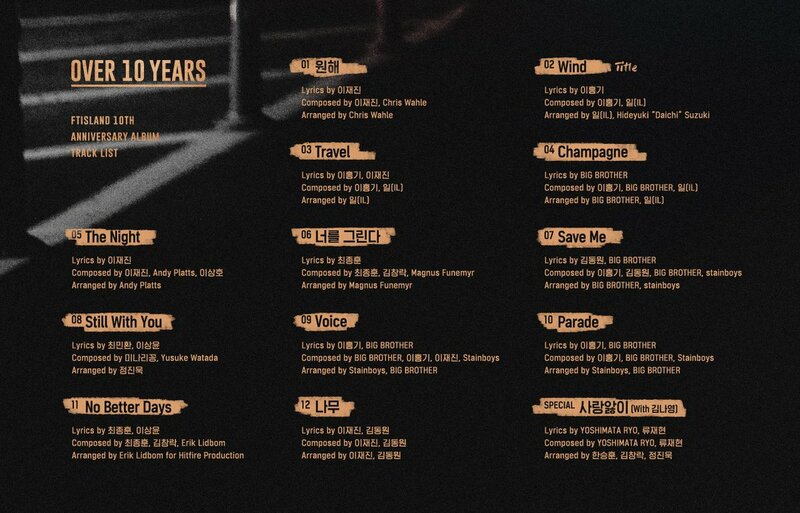 [NOTICIA] Póster del tracklist de “OVER10YEARS” y el medley – SOUND OF ISLAND. 원해 – Letra: Lee Jaejin; Compuesta por: Lee Jaejin, Chris Wahle; Arreglo: Chris Wahle. Wind (TITULO) – Letra: Lee Hongki; Compuesta por: Lee Hongki, IL; Arreglo: IL, Hideyuki “Daichi” Suzuki. 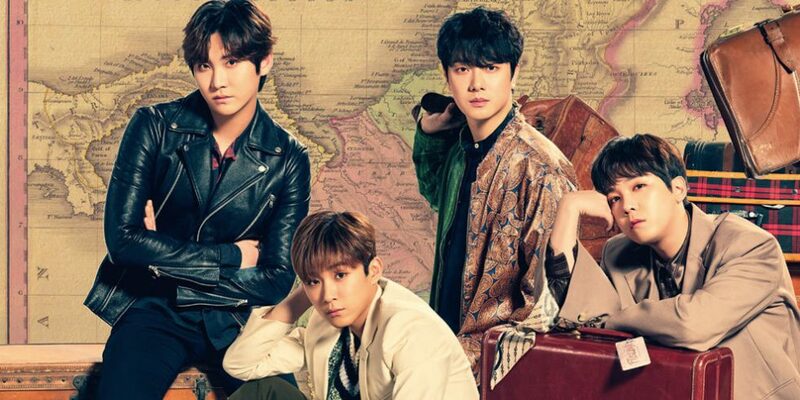 Travel – Letra: Lee Hongki, Lee Jaejin; Compuesta por: Lee Hongki, IL; Arreglo: IL. Champagne – Letra: BIG BROTHER; Compuesta por: Lee Hongki, BIG BORTHER; Arreglo: BIG BROTHER, IL. The Night – Letra: Lee Jaejin; Compuesta por: Lee Jaejin, Andy Platts, Lee Sang Ho; Arreglo: Andy Platts. 너를 그린다 – Letra: Choi Jonghoon; Compuesta por: Choi Jonghoon, Kim Chang Rak, Magnus Funemyr; Arreglo: Magnus Funemyr. Save Me – Letra: Kim Dong Won, BIG BROTHER; Compuesta por: Lee Hongki, Kim Dong Won, BIG BROTHER, stainboys; Arreglo: BIG BROTHER, stainboys. Still With You – Letra: Choi Jonghoon, Lee Sang Myun; Compuesta por: Minari Kong, Yusuke Watada; Arreglo: Kim Jin Wook. Voice – Letra: Lee Hongki, BIG BROTHER; Compuesta por: Lee Hongki, BIG BORTHER, Lee Jaejin, Stainboys; Arreglo: Stainboys, BIG BROTHER. Parade – Letra: Lee Hongki, BIG BROTHER; Compuesta por: Lee Hongki, BIG BORTHER, Stainboys; Arreglo: Stainboys, BIG BROTHER. No Better Days – Letra: Choi Jonghoon, Lee Sang Myun; Compuesta por: Choi Jonghoon, Kim Chang Rak, Erik Lidbom; Arreglo: Erik Lidbom for Hitfire Production. 나무 – Letra: Lee Jaejin, Kim Dong Won; Compuesta por: Lee Jaejin, Kim Dong Won; Arreglo:Lee Jaejin, Kim Dong Won. Special 사랑앓이 (ft. Kim Na Yeong) – Letra: Yoshimata Ryo, Ryu Jae Hyun; Compuesta por: Yoshimata Ryo, Ryu Jae Hyun; Arreglo: Han Seung Hoon, Kim Chang Rak, Jeong Jin Wook. Entrada anterior [VIDEO] Primer teaser de “Wind” – BREATH OF THE ISLAND.